Do you hate the cold of winter? Does your body reject constant sun and heat? Then follow us to Ponta Delgada, São Miguel, Azores, our winter destination. The Azores islands, comprised of nine islands, are part of Portugal. São Miguel is the largest and along with Santa Maria (discovered in 1427 by Portuguese explorers) form the eastern group. Terceira, Graciosa, São Jorge, Faial and Pico are the central group and the western group is made up of Flores and Corvo. The archipelago is located in the Atlantic Ocean, 1408 km from Lisbon and 3910 km from New York. It's no wonder the fish is fresh out of the water onto your plate. The mild maritime climate is affected by the east coast Gulf Stream.The daytime temperatures average 23 C in the summer and 15 C in the winter, ideal weather for a visit any time of year. The population of the archipelago is about 246,000, 138,000 of which live on São Miguel. 138,000 cows (one for every person) graze freely making the dairy and meat as wholesome as possible. WHOLESOME, the perfect way to describe life on the islands. It is only 5½ hours flying time from Toronto to São Miguel, the largest island of the archipelago. 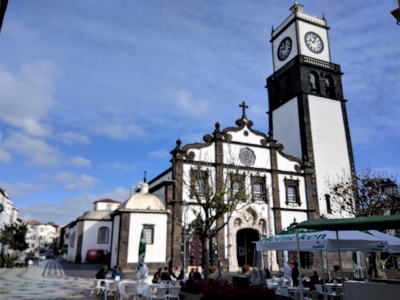 The capital is Ponta Delgada, where we can be found from early January to late March or early April. An added bonus is that there's only four hours time difference from North America (three hours when the clock springs ahead in North America in March and back to four when Europe springs ahead to summer time not long after). We always fly round trip, Toronto/Ponta Delgada, on Azores Airlines (formerly Sata Airlines). The flight schedule is convenient, service on the ground and in-flight, in all classes, gets better every time. The launch of the new name came with a commitment to constantly improve the flying experience. We opted for business class, which we consider very good value. The perks include generous luggage allowance and lounge entry for relaxation and comfort before boarding. The extra caring service is the icing on the cake. 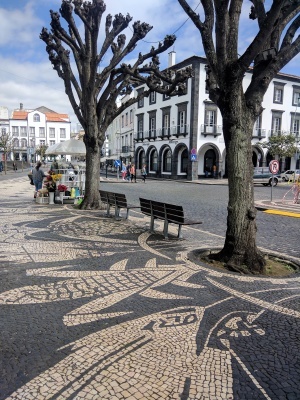 There are easy connections from Ponta Delgada to mainland Portugal, Cape Verde, the Canaries, Madeira and the other islands of the archipelago. Ponta Delgada is the cleanest city you will ever visit.There are rubbish containers attached to practically every building. Cheerful, uniformed men, with their special carts, clean them out regularly. Another group is armed with street vacuums to pick up anything not deposited in the containers. In addition, property owners are always sweeping and washing their sidewalks and gutters. There are large recycling bins strategically placed in every neighborhood. Somewhere over the Atlantic Ocean Linda and I mused about how lucky we were to have discovered the Azores in 2003. During our 2013 visit we decided Ponta Delgada was going to be our winter home. We began our search for a rental apartment and luckily found our future landlords, Eleuterio and Maria. After we cleared customs Eleuterio was right there with that big smile. The drive to the apartment on Machado Dos Santos is only 10-15 minutes. Our street runs west to east in the heart of town. This residential building is one of only a few downtown with an elevator. Eleuterio has three apartments in the building, two on the second floor and one on the third. Our second floor choice easily meets our needs. All rooms (living room, bedroom, bathroom and kitchen) are comfortably sized and furnished. Storage space in all rooms is excellent. There is a flat screen TV in the livingroom as well as an A/C-heating unit. The kitchen is fully stocked with cookwear, utensils, dishware, and glasses. There is a stove, washer/dryer, refrigerator, microwave, toaster, coffee maker. Basically we have everything we need in our winter home. Most important, the cleanliness is flawless, including in the public areas. All of our daily needs are in easy walking distance and we never tire of wandering the attractive streets of the old city center. (If the legs give out, there are four mini-bus lines, A-B-C-D, that service the city center.) The churches, monasteries and manor houses that were built in the 17th and 18th centuries define the essence of the historic center. New highrise apartment buildings and hotels have risen to the east and west of the center. Regardless of the length of our trips we have always traveled with carry on luggage only. Since we didn't always find a convenient laundromat we usually washed our clothes as we went. Thankfully we have Wash Now Lavandaria in the Solmar Avenida Center, Av. Infante D. Henrique,71. We drop it off before lunch and a couple of hours later, washed, dried, folded it's ready to go. All that and lots of smiles. There are very good dining options in the center, with patios facing the marina, to enjoy a meal, snack, or beverage while waiting. WIFI is free. We love our visits to the mercado minutes from home. There is nothing like the fresh aroma and the shopping tumult to stimulate the senses. The fisherman drop off their catches early in the morning. The farmers refresh their stands daily. The island-grown pineapples and bananas are always piled high. (There are two pineapple plantations in Ponta Delgada that welcome visitors; Profrutos-cooperativa De Produtores De Frutas and the family-owned Plantacao de Ananas A. Arruda.) The pineapples are grown in greenhouses in three stages in warm beds without relying on fertilizers and pesticides. The small, sweet bananas are grown everywhere by large producers and in private gardens. São Miguel is shaped like a whale, the south shore its belly. All around the rocky coastline are villages and towns resting amongst fertile farm and grazing lands decorated with stunning Azorean flora. Down to the sea are adorable fishing villages and beaches. Whitewashed houses with black volcanic rock-trim dot the landscape and line the narrow streets overlooking the sparkling blue sea from every angle. 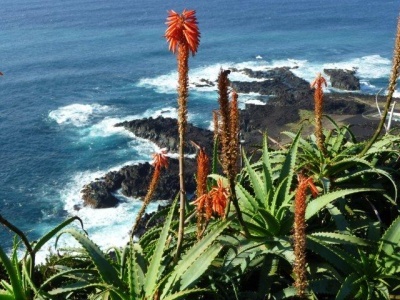 São Miguel was recently awarded a citation for the quality of its beaches and waters by the EU. A bit of history: The first inhabitants were recruited from mainland Portugal from Estremadura, Alto Alentejo and the Algarve. Offers of land and trade attracted people from Madeira, Jews from around the world and Moroccan noblemen. The island's geographical location between Europe, Africa and America and its fertile soil contributed to rapid economic expansion. Wheat and woad, an herb from the mustard family from which a bright blue dye for textiles was made, were the major crops. From 1522 to 1640 there were numerous setbacks: earthquakes, volcanic eruptions, Spanish influence, and pirates. Portugal recovered its independence in 1640 and new opportunities opened for São Miguel. Unfortunately the woad business was replaced worldwide by indigo from the Americas. Oranges became the new economic engine with crops peaking from 1860 to 1869. More bad luck, the orange trees were wiped out by disease. The consequence was serious emigration. The farmers fought back with crops of tobacco, pineapples, sweet potatoes (for distilling alcohol), esparto (for rope), tea, passion fruit, etc. An artificial harbor was created in Ponta Delgada which brought new industries and there was growth in fishing and cattle farming. Today the major industries are dairy and tourism while pineapple-growing and tea plantations continue to flourish. Speaking of home grown fruits, find your way to Rua Diario Dos Acores (alongside the Talisman Hotel. 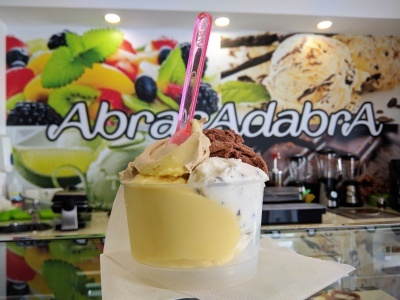 At the corner is Gelataria Abracadabra for creamy smooth, delicious, homemade gelato. We are there every day having to make the same decisions, what size cup or cone and which flavors? Size is based on the guilt factor of the day. Flavors? Two kinds of chocolate is the first hurdle, then, is it hazelnut, pistachio, stracciatella or vanilla, doce de leite? And then, there are the fruits; pineapple, passion fruit, blackberry, kiwi-banana, lemon, mango?? All are made from fresh quality ingredients and are rich in flavor. Go for it, indulge with abandon! Eleuterio also does custom-designed tours. Besides being an avid diver and hiker, he loves and knows every inch of the island. He has shown us those off-the-beaten-track delights that we all crave as well as the best of the best sights and sounds. Our first stop in Lagoa was at The Capuchin Convent of S. Antonio, built in the 1640s and rebuilt in the mid-18th century during which time 20 Franciscan Friars lived there. It was closed in 1832 and has served several purposes since then. This stunning edifice sits high on lovely park grounds overlooking the sea. The attractive chapel and cloister occupy the left wing which today is the head office of Lagoa's Charity Holy House. There is a library and one level down, the small but impactful House of Memories, which preserves the history of the Convent and recalls the presence of its inhabitants. Find your way here and see how the narrative takes place in three distinct periods: the past viewed through the present and as a future memory. And finally view the secret tunnel that ran to the seashore to allow Friars to escape from attacks. The road east along the sea leads to the secluded town of Caloura. The way in is through tall basalt walls separating vineyards. The striking Convent of Caloura is soon upon you. Built on the rocks by the sea, it is an imperative photo stop. Do not put your camera away because as you twist around the bend the broken rocky shore along the bay forms natural pools with bright white foamy waves spilling all over. It was a shiny sunny day so the scene was sparkling with life. At the end of the bay is a small fishing port. Nearby, the sheltered Caloura Beach is a divine spot for sun and fun lovers. Tree-shaded picnic tables, grills, snack bar, restaurant and restrooms provide all the amenities for a day of leisure. Eleuterio's next treasure was nearby Agua do Pau. This adorable town hosts some wonderful museums that preserve the history, traditions and culture of the past to ensure a legacy for future generations. Nuclei Museological, Rua da Riberia 27, has displays dedicated to trades and occupations; tailor, seamstress, barber, carpenter, shoe making, wine making, and cornmeal making (with water powered crusher). Neat to see the old tools and equipment. Upstairs is a typical kitchen and bedroom. The Mercearia Casa Central Traditional, Praca da Republica, is part of the Nuclei Museological. Its mission is to preserve the history of local commerce. To this end, a traditional grocery store and adjacent tavern were acquired. The grocery store with its counters, shelves and equipment displays the typical products sold. Upstairs is the beautifully-preserved living quarters of the owners. Praca da Republica is a center of activity, this time of day the fisherman were resting and playing cards as they would be heading out in the early morning to catch chicharros, small mackerels, the local favorite. The Fisherman's House museum (Casa do Pescador) is also supported by local government. We were fortunate the cheerful Carmen was available to show us around (perhaps Eleuterio had a hand in it) and bring it all to life. Everything in the house is authentic and a serious look at how a fisherman and his family lived in tiny rooms. The ground floor was the kitchen, eating and living area. Upstairs was for sleeping. We were impressed that this parish has devoted such great resources to preserving its history, tradition and culture. Heading east along the coast toward Vila Franca we passed one of the largest, most beautiful beaches on the island, Agua D'Alta, usually quite busy in the summer months. Our last stop was at a high point in Vila Franca as close to Ilheu de Vila, as you can get for an up-close view. This is the sea where Eleuterio does his diving. We were delighted with our half day customized tour. Another great tour starts by heading west from Ponta Delgada along the southern coast. A great stop is Merendario e Miradouro do Caminho Velho. Besides marvelous views of the coastline there is a comfortable barbecue and picnic area. Just pack your chorizo and charcoal. There are areas like this throughout the island at many viewpoints and along the roads. Ponta da Ferraria has a famous lighthouse which was built in 1901 in a traditional modern style with lovely well-kept grounds. Three families live, work and maintain the facility. Down below are swimming pools nature carved into the basalt, this day filled with frolicking bathers. There is a winding steep drive down to the thermal bathing facility where an attractive main building services patrons along with a restaurant. A large thermal pool is at the rear and a pathway and staircase lead to the natural pools. It's a neat place to soak, relax and heal. Miradouro Escalvado, a former lookout for sperm whales, supported the whaling industry of Mosteiros. High above the blue sea, the air is exhilarating. It is overwhelming, where to look first - the rock formations along the coast, cows grazing on the fertile lands, the town of Mosteiros in the distance, the volcanic cone of Camarinhas jutting up from the sea? Just linger and absorb the beauty and serenity. Mosteiros is an extremely attractive village with its old homes, fishing port and thermal waters. There is a deep bay with four small islands rising up in pointed shapes. 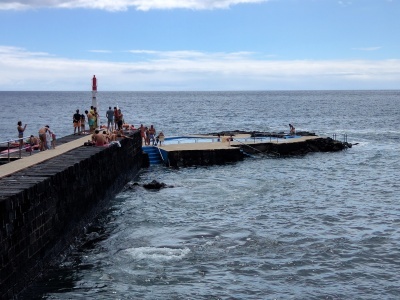 The beach opposite and the natural pools in the basalt lava make it a summer favorite. Climbing the green mountains from the seashore, the views of the sea behind and the valleys below alternate as you twist around each curve. Next are two preserved park areas, Lagoa Empadada and Lagoa do Carvão. Again a spectacular forested area with picnic and barbecuing spots and trails for walking and hiking. There are extraordinary views from the high point at Lagoa do Canario of the sprawling mountains, valleys and lakes all around. A little further along you will stop dead in your tracks at the sight of a huge green crater surrounded by uniform rings of trees and shrubs in the middle of which is the green waters of Lagoa de Santiago. Just when you think this string of beauty could not be matched, you arrive at Lagoa das Sete Cidades. At Vista do Rei, so called because King Carlos and Queen Amelia stopped here in 1901 to view the blue and green lakes, side-by-side, separated by a bridge. Legend has it that a princess and a shepherd met here and fell in love. They were forced to separate, but swore their love on the bridge. The princess' tears formed the blue lake and the shepherd's tears the green one. In reality the variance in color is caused by the spectacular vegetation surrounding the lakes and the sky which changes constantly with passing clouds. My writing was just interrupted by the chants of the Romeiros, religious pilgrims of São Miguel, passing just outside our apartment windows, a tradition that goes back hundreds of years. They come from all around the world. They walk the island roads, with humility for 8 days during the months of February and March. They travel clockwise in groups of dozens, from dawn to dusk. They carry a staff and a rosary, a scarf around their neck, a bag and shawl on their backs. As night falls they are given shelter by families that offer dinner and some hours of sleep. It's through prayer that they free themselves from the burdens of the world. Some have been pilgrims annually for 2 or 3 decades. To visit the middle of the island leave Ponta Delgada heading east and then north toward Lagoa do Fogo (Fire Lake), geographically right in the center of the island. As you wind your way to the top, dazzled by the views, the volcanic lake will suddenly emerge in its brilliant shades of blue. A peninsula of trees and small sandy beaches juts out on one side. The entire lake is surrounded by lovely greenery in a myriad of shades. There are hiking routes around the crater and if you want to catch some carp, red mullet or perch, just get a license. Driving north, follow the road signs and rising vapors down a dirt road to Caldeira Velha (old hot springs). You will find yourself in the middle of an exotic rain forest. Off to one side are pools of hot bubbling water (33c) from the old crater below. Just beyond is the breathtaking sight of a waterfall cascading down over the lava rocks and thick vegetation into a shallow natural pool where bathers enjoy the 31c thermal waters either swimming or getting close to the waterfall and enjoying the massage effect of the water hitting their head and shoulders. This is one of the island's most beautiful spots and combined with what we found at Lagoa do Fogo we get the message that Mother Nature has created something very special in this archipelago and especially here on São Miguel. 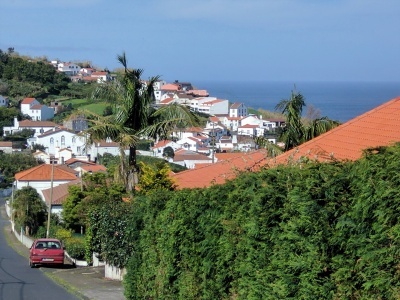 Ribeira Grande, the second biggest city, is located on the north coast in the middle of the island. The first settlers came to set-up watermills for grain on the fast flowing river that gave the city its name. The river flows from Lagoa do Fogo through the city to the Atlantic Ocean. Today the river is the center of the calm and peaceful atmosphere that we felt as we strolled the streets. The city grew from the area around the Parish Church, Nossa Senhora da Estrela, Our Lady of the Star, and the Town Hall. The gray, white, red and yellow exterior of the church is quite colorful and attractive. Its bell tower is in harmony with the white and black of the bell tower of the Town Hall. The Church of Espirito Santo, Holy Spirit, has an unusual design in that it has two doorways, the result of combining two former chapels into the present church. In the large square in front of the Parish Church is a statue commemorating the historian Gaspar Frutuoso, who is buried in the church. He wrote extensively about the area. Nearby is an attractive bandstand used for festivals. Opposite the Town Hall is a park shaded by thick, leafy trees with benches usually occupied by seniors. A relaxing, small garden along the banks of the stream hosts entertainment during the summer months. As in these main public areas, the narrow streets with attractive homes and mansions were spotlessly clean and the properties perfectly maintained. Furnas, on the east side of the island, is famous for its steaming, bubbling thermal waters which can be appreciated up close in the town center. Next to the lake is the Caldeiras da Lagoa das Furnas, which is well-known as the place for cozido (boiled meats, pork, chicken, vegetables) cooked in a huge pot buried in the ground. Local restaurants, and the public, cook their cozidos here. Most important is the glorious Terra Nostra Botanical Park. Enter a paradise - plantings from around the world nourished by the rich mineral waters below. The well-marked pathways will lead you through the various gardens and collections. The waterways meander along and amongst the groves of trees. there are small thermal bathing areas with changing facilities near the huge main thermal pool. No visit to São Miguel is complete without a visit to Terra Nostra Gardens. Nordeste is located on the northeast coast, about 60km from Ponta Delgada. It's all about nature here in the Municipality of Nordeste. The forested mountain ranges, Pico da Vara being the highest peak at 1105M, with river valleys and fertile pastures, is home to robust forestry and farming industries. The pretty town of Nordeste hosts the third economic driver, fishing. You know you're there when you spot the beautiful Ponte de Setes Arcos (bridge of 7 arches). The viewpoints along the northern and eastern coasts (Ponta da Madrugada, Ponta do Sossego, Salto da Farinha) boast fabulous views of the land and seascapes - breathtaking. If you're driving, leave the window open and inhale the aromas and sounds of nature. Of course bring your hiking boots or bikes, and spend a bit of time up close and personal. Povoação, the island's first settlement, is located on the southeast coast. The roads wind through luxuriant vegetation, rushing streams and a postcard-worthy water mill. Seven parishes on seven hills form the village, with narrow streets lined with white houses at the center, crossed by three streams that run down to the sea. Palames, a dark sand beach, is on one side and Morro beach is on the other. The Church of Nossa Senhora do Rosario (Our Lady of the Rosary) is one of the oldest on the island. Although the design is much the same as every other church, the decorative basalt trim on the facade and the setting make this one picture perfect. There is a memorial to the 1432 settlement of Povoação in the middle of a park in the center of town. Portugal has emerged from economic doldrums thanks largely to the growth of tourism. The word has spread that its peaceful culture, geographical diversity and beauty, and the warm welcoming nature of the people make it a desireable destination. These islands, while self-sufficient, rely heavily on tourism for any kind of improved standard of living. We are delighted to see the rebirth of the streets. The old homes lining the narrow streets are slowly being restored. Larger properties are being converted to condos, hotels and hostels while neglected ones are being refurbished. The entrepreneurs are stepping up to open new cafes, bistros and restaurants. The offerings range from standard and updated regional fare to Italian, Japanese, Indian, Chinese, etc. This activity is not confined to Ponta Delgada. Degrees of it are happening all around the island. Thanks to our dear friend Henrique, the most knowledgeable source of restaurants on the island, we enjoyed two new restaurants outside the city . The three of us headed to the north coast to Rabo de Peixe for a leisurely lunch at Botequim Açoriano a casual spot overlooking the sea. 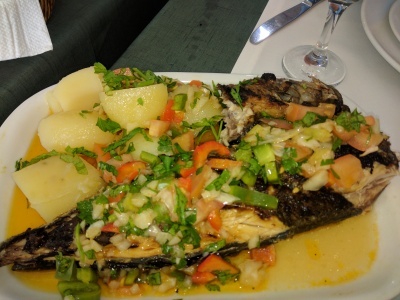 The offerings are pure Azorean with the emphasis on fish and seafood. We started with a variety of homemade breads, cheeses and delicious liver bites followed by grilled fishes and roasted octopus. A lovely white wine from the Douro region was a perfect partner. We finished with homemade walnut pie with cinnamon ice cream and a bean cake. A perfect Azorian experience. Henrique's second recommendation was A Casa Do Abel in the aforementioned town of Agua Do Pau, at Largo do Barracão,1. When our Canadian friends Ana and Frank arrived for their winter stay it was a no brainer as to where we would go for lunch. A Casa Do Abel specializes in meat. The cafe and bar at the front leads to a comfy, come-as-you-are dining room. Check out the refrigerated case where the beef, veal, pork and lamb are displayed. We were all in the mood for lamb! We started with a platter of beautifully-presented cod fish cakes, cheese-topped garlic bread, corn bread, pickled quail eggs, and bacalhao salad. The lamb chops were wonderful as were the thick cut fries. A marvelous treat was a side of cows cheeks. Our waiter recommended a red wine from the island of Pico, which was excellent. We finished with passion fruit panna cotta, and coffee. They opened in November last year and have already earned a well-deserved stellar reputation. It is worth noting that the owner of A Casa Do Abel also owns the marvelous fish shack, Bar Caloura, nestled in the harbor in Caloura. Here are some other restaurants we enjoy, in no particular order. 4Platanos, is located at Estrada Regional Lote 2 in the gorgeous town of St.Antonio (about 10 miles north of PDL). Since we do not drive, we took advantage of the transport offered by the restaurant. Ludgero, an affable son of the owner, picked us up near our apartment and on the way pointed out places of interest and stopped for photo ops. On the way home he detoured through St. Antonio village and the neighboring towns for us to capture the beauty of the rocky coastline. The glass structure has two dining levels with splended views in all directions. Hugo, another son (there are 8 children) greeted us warmly and showed us to our reserved table overlooking the town and sea. 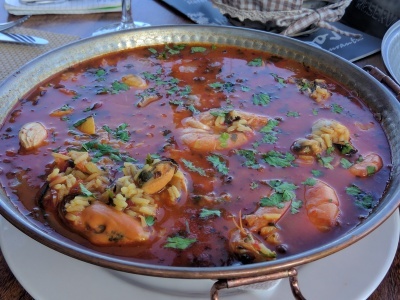 We were in the mood for their signature dish, "arroz de marisco", (seafood rice) for two, and a joy it was, probably the best we've had. It was served piping hot in a copper clam shell vessel and when the cover was lifted the aroma and sight of the succulent clams, mussels, shrimp and a myriad of other delectibles with rice in a spicy, savory broth made us ravenous. It was more than enough for two; we ate with relish and left only the shells. The island of Pico is famous for white wine which was a perfect match. Oh yes, we started with fresh cheese with marvelous bread from a nearby bakery. But we were not done, could not pass on the homemade chocolate ice cream - happy times! If you're not into seafood and rice, the menu has many traditional fish and meat offerings and judging from the looks of the dishes being served around us, you can't go wrong. The family works very hard to please. Mariserra faces the sea at Rua Praia Dos Santos 61, Sao Roque,Ponta Delgada. It is 30 minute walk or 9 minute drive along the sea from the city center. This is a place for seafood, from the nautical ambiance, to the sea beyond. Be greeted by a tank filled with everything crustacean and a display of the day's fish resting on a bed of ice. Who could resist the special menu item of 3 grilled fish? We were delighted to find that they had "cracas", a crustacean which looks like a tiny volcano. It feeds and breathes through a hole at the top. They are mostly harvested in clusters. 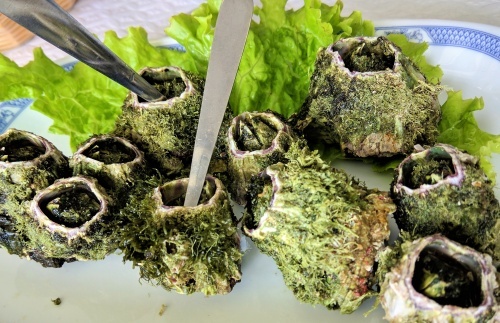 Inside these creatures is a tiny white morsel of sweetness and seawater which are lifted out with a metal pick. A short straw enables you to enjoy the delicious water remaining in the cone. This is a wonderful way to pass time while waiting for the main course. Of course, a bottle of that white wine from Pico, aids the process. The fish were perfectly grilled split open and were accompanied by a mound of fresh sauteed vegetables, and awesome baked sweet potatoes. The passion fruit mousse was a heavenly finish to a great meal. 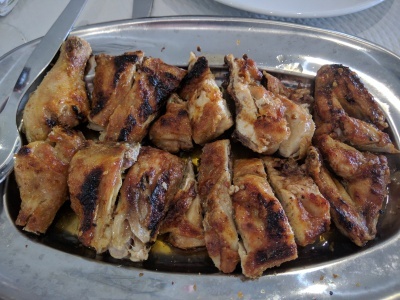 Restaurante Ramires, which features chicken made famous in the town of Guia in the Algarve, is now in Ponta Delgada at Portas do Mar. They use organically-grown, small chickens which are cut in rib-like slices, grilled with a secret piri-piri sauce and served with a large portion of superb fries. The tomato salad and creamed spinach are excellent extras. Floresta Lisbonense is located on Rua Dos Combatentes da Gandeguerra, an alley behind the Maritime Police Building on Avenida Marginal. The menu of the day with 6-7 offerings is posted to the left of the open window. Mom is in the kitchen cooking her version of typical local recipes. The portions are large, the prices small. Her sons deftly handle the constant stream of regulars, including us, anticipating every need. It isn't fancy. It's a fun, thrifty, absolutely local experience. Casa do Pasto Tavares, at the corner of Rua Melo and Rua Bettencourt, is a family institution. This is a typical neighborhood tasca complete with blue tile walls (azulejos). The daily menu includes the freshest fish of the day, and traditional meat, pork and chicken dishes. Your plate will be full, while the prices are moderate. Join the regulars at lunchtime and enjoy the hustle and bustle. Aliança, Rua Acoreano Oriental, 19/23, has a homey ambiance and service that makes it a totally relaxing experience. The regular menu has well-chosen offerings. The daily list is primarily made up of the fresh fish selections and traditional regional specialties. We come here regularly for the fresh fish and the excellent quality regional steak. Both are expertly grilled and seasoned. For total ecstasy be sure to have either the orange or coconut pudding cake for dessert. Cozinha dArlete, is located in a residential section, northeast of the center, at Rua Professor Machado Macedo, 12. It's only a 30 to 40 minute walk or 15 minutes on the "C" minibus from downtown. If you want to eat in, don't wait in the long take-out line, just pass into the bright and cheerful dining area. The owner presides over the display of the daily offerings insuring every plate is properly filled and presented. Everything is market fresh quality and cooked with loving care. There is a regular menu (we have never looked at it as the deciding on the specials of the day is enough of a challenge). They also specialize in catering. Find your way to Cozinha d'Arlete for a memorable Azorean meal. A Tasca situated in a renovated old jail on Rua do Aljube,16, boasts a charming, updated warehouse environment. Tables are close which encourages interaction and conversation with your neighbors. The staff is sociable and extremely helpful. All these elements contribute to an immediate feeling of fun and relaxation. Once comfortably seated you can select from the well-executed, creative menu presented in the form of a newspaper. There are also daily blackboard specials. Across the way from A Tasca, on Rua Aljube, there is a cute new eclectic pub, Canto Do Aljube, decorated with antique artifacts, like a piano and manual typewriter. They have won our hearts with their lunch time only fabulous Indian vegetarian offerings prepared by chef Komalpreet Singh. The pub menu is varied and intriguing. Upstairs at Rua Ernesto Do Canto, 21, you will find an excellent burger at BIG 21. The come-as-you-are environment and pleasant service makes it a neat experience. The short menu features a nice assortment of starters, steaks and seafood. Mimo Cucina Italiana, Rua Dr Gill Mont Alverne Sequeira, 16 (between Gelataria Abracadabra and Campo São Francisco) brings the flavors of Italy to Ponta Delgada. The comfy environment invites a leisurely dining experience. Your hosts Ben and Guida insure your comfort and satisfaction. We had a rich delicious pasta bolognese and a superb quality sirloin steak. There are many pasta and meat choices plus daily specials. The house red wine was quite good. Mimo is a welcome arrival to the dining scene. Entre Nós Bistrô restaurante is in the center of the city at Travessa do Henriques,6 on the 1st floor (upstairs). This is a very narrow way off of Largo V. Bensaude. Look for the bright signs at the corner. There is a comfy bar and dining area leading to a good size dining room with floor to ceiling windows. The building has 120 years of historical charm. The owners and staff are committed to making your visit a most pleasurable experience. While the menu offers a variety of regional offerings we were in the mood for great hamburgers, and so it was. Pure São Miguel products - lean beef grilled perfectly medium rare topped with luscious cheese, crispy onions, tomato and lettuce all tucked into a perfect bun accompanied by fresh, crisp organic green salad. The humble burger was never so beautifully treated. 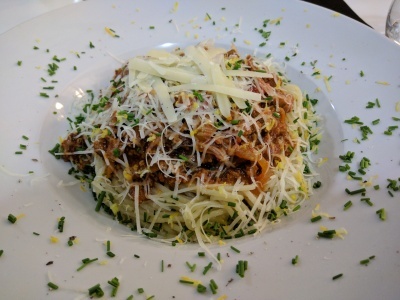 On another visit we had a fabulous spaghetti bolognese and the best ever bacalhau natas. The house red wine from the Douro region was delicious. The kitchen takes pride in presenting photo-worthy plates. All this excellence at reasonable prices. Taberna Açor, Rua Dos Mercadores, 41, is a unique casual dining option on the "Merchants Street". The space is rustic with lots of wood and stone. After getting settled on our stools at a square wooden table, we were presented with pages and pages of menus separated by catagory: hot and cold appetizers, tapas, cheese and meat platters, salads, sandwiches, etc. There are extensive wine, beer and cocktail menus. We shared fresh white cheese, fish soup in a bread bowl and pork sandwiches. Again, a very good house red. 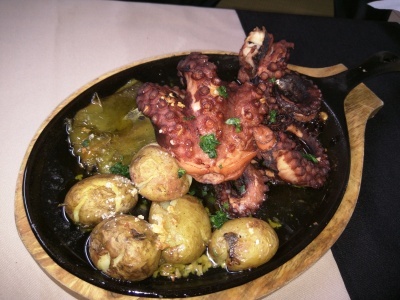 Restaurante TiXico, Rua Eng Jose Cordeiro, 20, has a bright contemporary appearance and fairly traditional offerings. The fresh fish of the day, bathed inn ice, are highlighted as you enter. We were the first in for lunch on the grand opening day. It all went very smoothly which was a good sign. After the customary starter of fresh cheese and bread, we had a wonderful, creamy, flavorful fish soup. Next up, the chefs steak, a tenderloin topped with egg, fries and fresh greens. The house red was fruity and dry, very good. The owner's wife made a layer cake that was a wonderful way to finish a delicious meal. Meanwhile the restaurant was filling up and they were off to a good start. A Comercial Cervejaria da Cidade at Rua Machado Dos Santos 75 has reopened under new ownership and new concept. It's a great city center location with a welcoming ambiance. Come early morning for breakfast, return for lunch and come back for dinner. It's also the kind of place that you will want to stop in for a coffee, beer or cocktail and be able to catch a football game. A neat spot for good food and friendship. Opening day we had the two daily specials, bacalhau natas (creamed codfish) and Alcantra (roasted meat, chorizo and potato) with small sides of iscas figato (pieces of fried liver) and molinas (chicken gizzards). All pure regional specialties extremely well done. The house red was quite good. Garotos and orange cake (changes daily) was a welcome finish. An old building with stone walls and arches at Rua Antonio Joaqium Nunes Da Silva 21 has been transformed into a smart new addition to the restaurant scene. Welcome to Tasquinha Vieira. The two cozy dining rooms and patio are separated by a sparkling cucina where Joel and the crew create their magic. Our sauteed mullet with Potato Mille-Feuille and veggies attest to their skillful preparation and presentation. A delightful lemon Crema Catalana was a light and lovely dessert. On the lighter side is Diálogos com Canela, just downstairs from our apartment on Rua Machado Dos Santos. 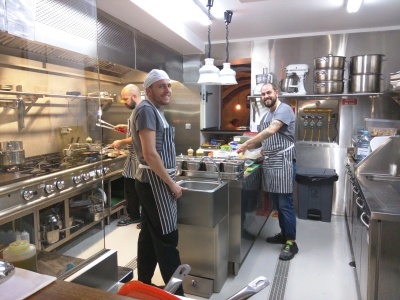 Our old friend João and his happy staff serve up daily hot specials, offer a sumptuous salad bar, sandwiches, soup, an eye catching array of pastries and excellent coffees. Find your way to Rua Diario Dos Acores (alongside the Talisman Hotel), where you will be greeted with an excellent selection of homemade Azorean pastries and confections at Paraíso das Delícias. Unique to this shop is a sweet potato bun made with nuts and raisins that is awesome. Any of these goodies with an Illy coffee will be a treat. It's time to head back to Toronto. Eleuterio will take us to the airport and Azores Airlines will whisk us away. We've reserved our apartment for next year and as soon as our flights are available online we'll book. Hope to see you here next winter.